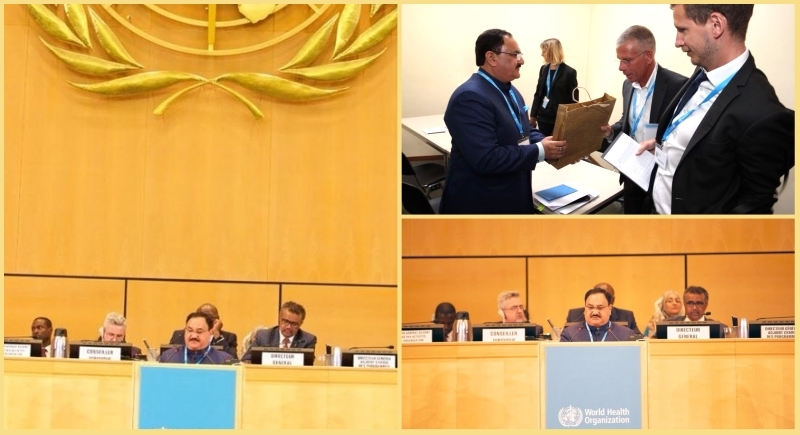 Geneva, May 22: “India is firmly committed to achieving universal health coverage for its citizens as has been articulated in our National Health Policy 2017.” This was stated by J P Nadda, the Union Minister for Health and Family Welfare during his addresses at the Plenary Meeting of the 71st World Health Assembly, at Geneva today. The Health Minister spoke on the theme: Health for All: Commit To Universal Health Coverage. Reiterating the commitment of the government, the Union Health Minister said that India has fast-tracked many initiatives aimed at achieving all the tenets of Universal Health Coverage i.e strengthening health systems, improving access to free medicines and diagnostics, reducing catastrophic health care spending to translate our vision of achieving UHC. The Union Health Minister further said that our PM Narendra Modi, has recently launched Ayushman Bharat. The programme rests on the twin pillars of Health and Wellness Centres, the provision of comprehensive primary healthcare services and the Prime Minister’s National Health Protection Mission for secondary and tertiary care for 100 million families covering 500 million individuals. “We are reaching out to approximately 40% of the country’s population who will be provided an insurance cover of Rs 500,000 per year. This will be the world’s largest government funded health protection scheme in the world”, Nadda added. The Minister further said that to reduce the burden of NCDs, India has already initiated universal screening for prevention and management of five common NCDs: hypertension, diabetes and three common cancers – those of the oral cavity, breast and cervix for individuals at pan India level. We have also started providing medicines for cancers, cardiovascular diseases and cardiac implants at significantly reduced prices,” Nadda elaborated. Nadda informed the participants that in line with India’s ambitious plan to end TB by 2025, the Government has started the implementation of the National Strategic Plan for TB and allocated 550 million dollars. “Apart from rapid scale up of diagnostics and treatment, we have introduced supplementary nutrition for patients for duration of treatment,” Nadda said. Earlier, Nadda also addressed the Commonwealth Health Ministers Meeting on the sidelines of the 71st World Health Assembly and spoke about the global fight against Non-Communicable Disease (NCDs). He said that interventions for prevention and control of NCDs are to be prioritized and are to be integrated at all levels of health care delivery systems. He said that for comprehensive management of lifestyle related disorders, a pilot project on ‘Integration of AYUSH with National Programme for Prevention and Control of Cancer, Diabetes, Cardiovascular Diseases and Stroke (NPCDCS)’ has been initiated. Synergy is being harnessed between Allopathy system under NPCDCS and alternative systems of medicine under AYUSH, for prevention and management of ‘lifestyle-related’ common NCDs, he added.